"Let me see if I've got this straight, Lieutenant; it's an eight-foot creature, with some kind of acid for blood, kills on sight, and is generally unpleasant." After escaping the colonized planet and destroying the nasty Alien Queen, an exhausted Ellen Ripley (Sigourney Weaver) finally gets a chance to take some much-needed rest. She travels calmly towards Earth in hypersleep with Corporal Hicks and Newt, but of course her eternal enemy strikes again. Their EEV ship separates from the Sulacco and crashes violently into an unknown planet. Ripley survives the disaster, but learns that her companions have been killed. Could anything be more depressing than this unfortunate news? Sadly, she also discovers that the alien has survived, and her current setting has no real weapons of any kind. Trapped within the antiquated Fiorina 161 facility, Ripley must again face her greatest fear and deal with an even more shocking personal discovery. Alien 3 opened in May 1992 and faced tremendous expectations from the series' devoted fans. The studio heads were banking on a huge box office performance, which placed tremendous stress on director David Fincher and the crew members. The stories coming from the set revealed a nightmare production that frustrated the young filmmaker and eventually caused him to spurn the picture. Upon its release, audiences were dismayed at this extremely bleak story that lacked a human connection and offered few remarkable moments. Filming took place without a finished script, which helps to explain its lack of coherence. The overall result was a total disaster that ranks among the most disappointing movie releases of the 1990s. This release provides the option of viewing the original 114-minute theatrical version or the newly extended 144-minute "Assembly Cut," edited together without Fincher's approval. This longer version does not provide a complete overhaul, but it does include more personal moments and a few surprising plot elements. Compiled using the original shooting script, notes from Fincher and editor Terry Rawlings, and an unfinished print, this cut flows surprisingly well and has a smoother feel than the original picture. However, it still suffers from a cold, detached atmosphere that makes it difficult to become immersed in the tale. The main premise has its own problems that will not disappear even with the improvements brought by the extra footage. The newly restored scenes place the chestburster inside a large ox, which replaces the silly dog from the theatrical version. The creature is an odd four-legged being that does not look very realistic, but the scene does represent progress over the one from the original cut. A major subplot also appears involving the crazed Golic (Paul McGann) character, who actually frees the alien from a successful trap in a strange fervor. This cut includes more religious imagery and provides a slightly Gothic tone more in line with original director Vincent Ward's vision. Interesting lines of dialogue also reappear to enhance the Clemons (Charles Dance) role and make his demise more tragic. The final confrontation between Ripley and the human Bishop (Lance Henriksen) also gets a makeover, which adds weight to her ultimate decision. Unfortunately, both cuts of Alien 3 struggle with the same problems that seriously lessen the experience. The enemy just looks silly this time and does not inspire the fear generated in the first two entries. The onset of CGI effects actually hampers the design and leads to a sometimes obvious computer-generated being. The central action scenes involve the alien chasing a nearly indistinguishable group of bald guys through narrow corridors. The first-person style does provide some inventive shots, but it generates little tension. The grisly deaths of many victims mean little because we barely understand the personalities of these men. The bleak and fiery setting does allow for some noteworthy photography, but it falls well short of the memorable images presented in the other pictures. 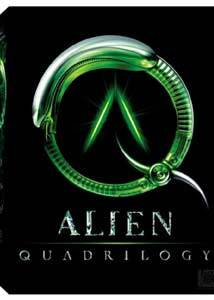 This third entry in The Alien Quadrilogy is arguably the worst of the series and fails to retain most of the momentum generated by its far-superior predecessors. Image Transfer Review: This film utilizes an impressive 2.35:1 anamorphic widescreen transfer that keeps the picture sharp and clear. Even the numerous dark shots contain little grain and provide effective images. The special edition's new scenes retain the quality of the theatrical version and create a nearly seamless visual atmosphere. It's too bad that the CGI effects look so unrealistic. Existing on the same level as Alien's excellent transfer, this presentation delivers a top-notch viewing experience. Audio Transfer Review: Alien 3 offers a 5.1-channel Dolby Digital transfer that helps to generate some intense sequences. The audio moves well throughout the soundfield and presents the effects very well. It is unfortunate that this film lacks a DTS track, but this digital version still works solidliy. The special edition does have some moments with very quiet dialogue that was never enhanced for the picture. Extras Review: Alien 3 continues in a similar vein to the first two pictures with the major exception of David Fincher choosing not to be involved. The commentary track includes the technical guys and a few actors, but it really suffers without the director. The scenes would really benefit from knowledge of Fincher's goals for each moment. Editor Terry Rawlings leads this track, which includes separately recorded groups discussing their experiences. The statements move across the deleted scenes and mention their deletion, but could have given us more compelling information about these cuts. A "Deleted Footage Marker" allows us to recognize which scenes are new when viewing the special edition. The theatrical version includes all 26 deleted and extended scenes within a separate menu on Disc Five. Renny Harlin was actually hired first for Alien 3, and he speaks about his original approach to the third picture. The idea of using the real alien planet or Earth both sound much better than the final result. Harlin nicely articulates his troubles and seems passionate enough to make a great picture. Michael Biehn and Carrie Henn also discuss their thoughts about returning and having their characters become a family with Ripley. Typically, the studio pushed the release date, which limited the creative process and hampered the film. The producers also provided silly objections to the next writer/director, Vincent Ward, which led to a duller tale. Ward's comments are fascinating and depict everything wrong with a profit-minded studio trying to control artistic people. Vincent Ward's gothic ideas about a spherical space station devoid of technology appear ingenious and much better than the actual story. He discusses the story concepts, which do relate mildly to the film's religious side but are much crazier. Several designers also seem excited about the possibilities for Ward's vision. To be fair, several studio guys do appear and offer their problems, which do make sense. Surprisingly, we also learn that Weaver insisted that her character be killed and not return. More interesting drawings appear here concerning the early conceptions of the project. Elements are divided into three sections�the EEV, Arceon: The Wooden Planet, and the Alien Mutations. The most worthwhile shots involve the scuttled ideas for the planet, with the odd alien shapes also notable. I guess they ran out of creative names. This feature begins by showcasing the fact that first-time director David Fincher lacked a completed script. The various producers and crew members discuss his considerable talents and the reasons for the choice. Fincher's absence is very unfortunate because everyone can speculate about his thoughts, but it's not the same thing. Chaos seemed to reign at this point, especially among the baffled crew members. I generally find storyboards interesting, especially when compared to the actual picture. These early drawings cover five specific sequences, including "Burning the Dead" and "An Inmate Gets Diced." These slides present the initial concepts for both the exterior and interior of the Fiorina "Fury" 161 facility. The detailed inside drawings are very nice and sometimes closely match the eventual film. Surrealist H.R. Giger returned for Alien 3 and redesigned his initial concepts to make the alien more beast-like. The process took place this time via fax machine, with Giger remaining in Zurich. The strange guy specifically discusses the changes to each alien part. We also observe many drawings and the creature's actions. Afterwards, the crew discusses their inability to do some of Giger's new designs. In case the exciting title wasn't clear enough, this feature represents the first segment of the production area. Similar to the previous film, this picture once again had an extremely difficult shoot. To begin filming without a script for this type of movie is very irresponsible, and it shows in the finished product. Plenty of production footage appears, and the actors discuss their admiration for Fincher's talents. Without the director's input, the stories feel disjointed and lack the same value of the earlier production features. One saddening tale involves the original cinematographer, who suffered from Parkinson's disease and had to quit. It's intriguing to see them shooting the tunnel scenes, which require the camera guys to run down the corridors at full speed. A large number of photos appear in this gallery and showcase the tremendous work required. We view the progression of Sigourney Weaver's bald hair cut, observe huge sets, and witness shots from the final confrontation. This five-minute feature sounds more interesting than it actually is. Numerous little people scurry quickly around the scaffolding and slowly build the gigantic furnace sets. Theme music plays in the background and everyone seems very busy, but I was ready to take a nap. Alien effects creator Alec Gillis begins by discussing the super facehugger and the "Bambi burster" that never made it into the theatrical cut. The ox scenes were a huge ordeal, so it became frustrating for them to see it deleted from the final movie. They also tried to place makeup over a real dog, which led to silly but poor results. The nasty Bishop android became an animatronic figure and didn't use the typical makeup effects. It's an impressive technique and is not easily recognizable when viewing the movie. Of course, we also learn even more about crafting the diverse alien designs and the guys who wear the alien suits. Amalgamated Dynamics Incorporated (ADI), lead by Tom Woodruff, Jr. and Alec Gillis, did the actual creature effects. This group of photos shows the team working diligently on various models, including the realistic-looking Newt creation. This nice feature gives us five different angles for viewing the bioscan of Ripley's doomed body. The options are the skin surface, musculature, organs, skeleton, the final shot, and a composite of all five. Creator Alec Gillis provides audio commentary over this scene. This engaging section begins by discussing the problems caused by script troubles and no specific schedule. The studio decided to take a break without having completed the shooting, with Fincher and Rawlings creating an edit. The three-hour rough cut was a virtual disaster and even grossed out some of the technicians. The decision-making process sounds unbelievable, and the poor result makes sense given these troubles. The ending created a major stir and was rushed to finish the movie in time. Budgetary issues and studio time constraints ultimately harmed the picture, and editor Terry Rawlings discusses their negative effects. Production executive Jon Landau tries to positively explain the decisions, but his arguments make little sense. The cast and crew speak about David Fincher's genius and their respect for his talents during this quick feature. We view him working on the production and learn about a few more on-set changes by silly Fox people. The director looks very stressed and exhausted in these shots due to the intense pressure on him. We do hear from Jon Landau and David Giler about their opinions, which could be valid, but it's hard to judge who's really telling the truth. Once again, it would have been great to hear Fincher's opinions today about his experience. The goofy alien never really looks menacing in this film, and this entry shows us how they constructed its movements. A rod puppet was placed in front of a blue screen for the primitive digital effects that lack the believability of the first two pictures. The setup seems very difficult and was brand new, which makes the eventual result more understandable. They also discuss the miniature creation, which included the facility's exterior setup for the furnaces. The matte painters even get involved and present the planet and sky background. It's also worthwhile to hear the crew discuss how composites were still not done with computers at the time. Composer Elliot Goldenthal aimed to create a score that had no association to the earlier films. He openly discusses the specific intentions for the songs and how they related to the story elements. The last-minute changes to the ending also affected him and made his work more difficult. Fincher actually considered having just sound effects and no score, which would have been very ambitious. It's no big surprise to learn that more problems occurred with the sound mix, and Fincher had disappeared from view. Goldenthal tries to be nice, but he obviously is very frustrated with final product. Here are the last two photo archives on this disc, which present the visual effects and those silly promotional shots. The first section shows ADI in action constructing the alien models. Hmm. This should be interesting. Everyone chooses their words very carefully and finds things to like about this film. It is nice to hear Alex Thomson, Elliot Goldenthal, Vincent Ward, and Renny Harlin provide very honest statements that are both fair and true. I'm not sure if I agree that it has gained more acceptance over time, but it's still worthwhile to hear everyone's thoughts. Subtitles are included to make the scenes more understandable. Standing apart from the series, Alien 3 is a mediocre monster movie enhanced by impressive acting performances from Sigourney Weaver, Charles Dance, and Charles S. Dutton. Unfortunately, this film must be considered in relation to its predecessors, which makes it a disaster. David Fincher does craft an inventive style, but the muddled story and uninteresting characters lessen its effectiveness. The extra footage solves a few problems, but it fails to save the franchise's least-successful entry.